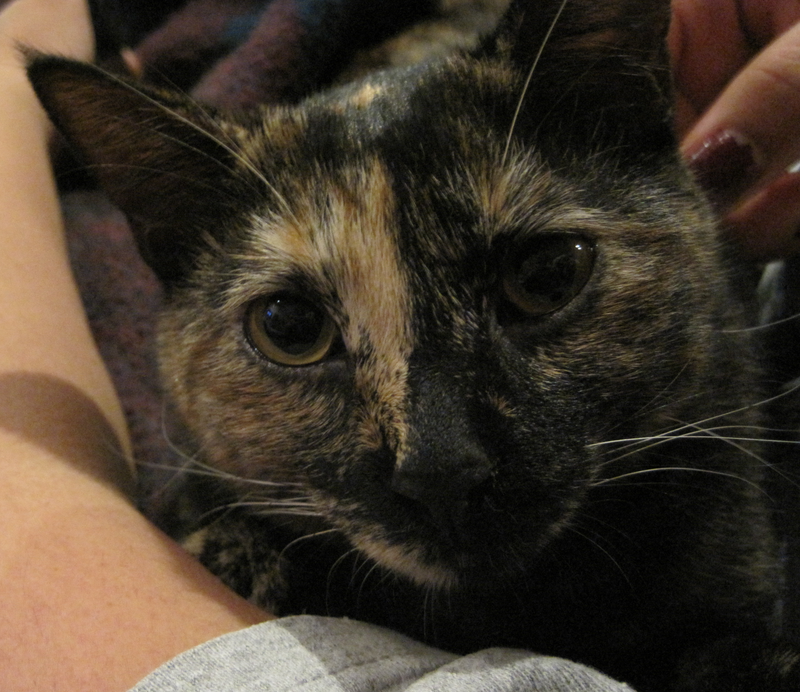 She's a domestic shorthair with tortoiseshell markings, six months old, and on Saturday she joined the household. Roxy was adopted from a local cat rescue shelter. She is very curious, playful, but also quiet, shy and skittish, and likes to explore the house to find new places to hide. (We're going to have to get used to looking into closets and so forth before we close doors.) Oddly enough, she also loves to snuggle and will lie in the crook of V's arm for hours, relaxing and purring. Her drug of choice is the laser pointer. I'm not kidding; it's like kitty cocaine. We expect it to take some time for her to adjust to us (and vice versa), but in the meantime she is bonding with Miss V, who has made taking care of Roxy her primary responsibility. And yes, she knows she's pretty.